Temperature of an object is determined by three modes of heat transfer: conduction, convection, and radiation. While conduction and convection are generally easier to understand, radiation is often the most important mode of heat transfer. Understanding the underlying principles of radiation heat transfer helps to accurately measure surface temperatures at a distance with Apogee’s Infrared Radiometers (IRR). In this post I outline the essential principles in order to help you make better measurements. A blackbody absorbs all incident radiation, regardless of wavelength and direction. For a prescribed temperature and wavelength, no surface can emit more energy than a blackbody. Although the radiation emitted by a blackbody is a function of wavelength and temperature, it is independent of direction. That is, the blackbody is a diffuse emitter . Generally speaking, a blackbody is the perfect absorber and emitter. It is the standard we compare other radiating surfaces against. No other surface absorbs more energy or emits it than a blackbody. In addition, no radiation emitted from a blackbody is reflected from other sources. and the temperature is measured in Kelvin. Accordingly, for a non-blackbody, the emissive power is Eb=εσT4, where ε is the emissivity of the surface being considered (0<ε<1), and ε = 1 for a blackbody. 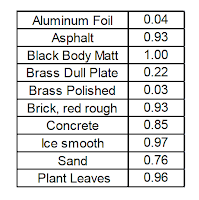 The chart below shows emissivities for common materials. Additional values can be found at its source: http://www.engineeringtoolbox.com/emissivity-coefficients-d_447.html. Although emissivities are not constant over all wavelengths, it is generally accepted practice to assume them constant due to the small amount of variation over the different wavelengths for most materials. For plant scientists, it might also be interesting to consider the emissivities documented for various plant leaves and diverse vegetation over different wavelengths (http://g.icess.ucsb.edu/modis/EMIS/html/leaf.html). 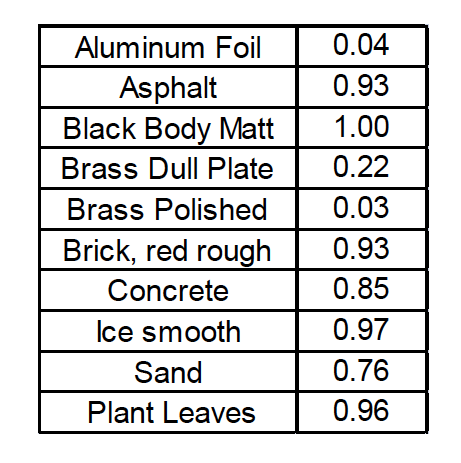 If emissivity isn’t taken into account, the surface temperature of an object may appear to be emitting more radiation, due to the addition of reflective radiation for instance, than it really is and thereby giving us an incorrect perception for the emissive power or temperature of that surface. This can be especially true for an IRR sensor that has been calibrated to a nearly standard blackbody surface. The calibration procedure for Apogee’s IRR sensors ( http://www.apogeeinstruments.com/content/SI-calibrationposter.pdf ) shows just that. The question then is: how can I adapt for such a situation? In order to apply the above equation however, we must measure or estimate with reasonable accuracy the brightness temperature of the background (Tbackground). For a more in-depth explanation of how to do so, please see: http://www.apogeeinstruments.com/content/SI-emissivitycorrection.pdf. In any case, as the emissivity of what we are trying to measure moves further away from a blackbody, the more that emissivity error is introduced due to reflected radiation from surroundings. For example, the target temperature of a 25°C plant leaf on a sunny day could provide an error of -1.5°C, without emissivity correction . That’s an error that most scientists can’t tolerate. 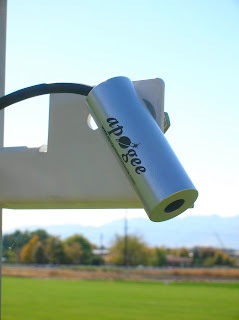 In almost all situations, having a precise IRR sensor, such as Apogee’s ±0.2°C accurate IRR sensors won’t be enough. Emissivity correction is required to minimize error in your data. Whether you are using it in on a plant canopy or monitoring icy road conditions, emissivity correction will help you make better measurements. “Fundamentals of Heat and Mass Transfer” Incropera, F.P., Dewitt, D.P., et. al. 6th Ed. 2007, pg 736. “A Review of the Physics for Emissivity Correction of Infrared Temperature Measurements” URL: http://www.apogeeinstruments.com/content/SI-emissivitycorrection.pdf.